Ghost Shrimp can be found in many places along the Southern California coastline. 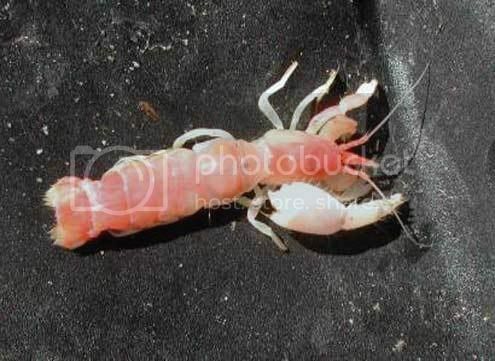 Adult Ghost Shrimp grow to about 4 ½” long and the males tend to have one claw that is extremely larger than the other. The color of a Ghost Shrimp will range from being pure white to a deep and rich orange color or even a combination mix of both colors sometimes. Ghost Shrimp live in sandy and muddy inertial zones, bays and estuaries. They dig deep burrows which are often shared with other fish and invertebrates. They eat detritus which is small pieces of organic waste and plankton. As far as locations, look for beaches and bays that have exposed mud flats during low tides. I’ve found that low tide is a must to finding Ghost Shrimp in quantity. A negative low tide is best, but not absolutely critical. You'll know a good location by the number of burrows. 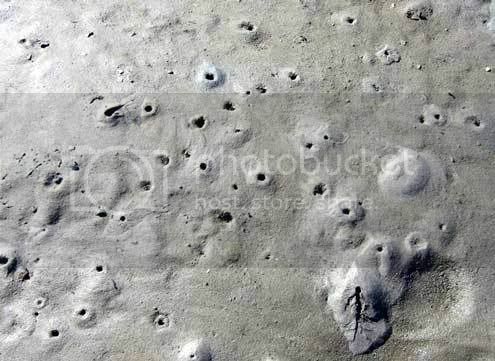 The best burrows for collecting are in "wet zones" of any mud flat. The mud should still be saturated with water as this will also make your pumping a lot easier. Ghost Shrimp make fantastic bait for fishing off the beaches of Southern California! All sorts of surf species fish like Corbina, Perch, Halibut, Sargo, Spot Fin and Yellow Fin Croaker can be caught while using this easily obtained surf fishing “candy” bait! While some coastal tackle shops occasionally offer fresh or LIVE Ghost Shrimp for sale, you’ll soon find that’s not always the case and that most of the time if they do have some Ghost Shrimp in stock, they’re frozen. There’s nothing worse than getting to the beach on one of those special days when the bite is red hot and finding out that live Ghost Shrimp is the preferred “go to” bait of the day. You make a quick run to the local tackle shop and the sign says “no more Ghost Shrimp”, or worse yet, they don’t even carry Ghost Shrimp! Rather than be disappointed, why not catch your own? The most preferred way to do this is with a “Ghost Shrimp Pump” also known as a “Slurp Gun”. Basically, this gun is nothing more than a suction device that produces a vacuum when the handle is pulled. When the bottom of the “Ghost Shrimp Pump” is placed over the hole of the Ghost Shrimp burrow and the handle is pulled up, all the sand is sucked up and hopefully the Ghost Shrimp is sucked up as well! When the contents of the “Ghost Shrimp Pump” is expelled the angler searches through the discarded mud or sand for the Ghost Shrimp. It’s as simple as that! Place your “Ghost Shrimp Pump” over the center of the burrow and pull the handle. This will cause the pump to dig into the mud while pulling the burrow's contents into the chamber. In one swift motion pull the pump out, aim it at the ground and push the handle down. This will expel the mud and water and hopefully a Ghost Shrimp! Repeat a few times in the same hole if need be. Most Ghost Shrimp burrows have multiple entrances and exits. If you haven't got the shrimp out in three or four pumps, move on. Be sure to have some sort of small container to keep your Ghost Shrimp alive in and place your Ghost Shrimp in it with some mud and saltwater. Be sure to go back and check the holes you pumped a few minutes afterwards as sometimes Ghost Shrimp are easily missed in the mud, and occasionally come to the surface if their burrow has collapsed. Remember that these little guys are a vital part of the ecosystem so don't wipe out every burrow in a small area and never take more than you need for that day. Try to space out your collecting over a large area. I recommend that you return any egg laden female back to the hole it came from! Ghost shrimp can be notoriously delicate on the hook, resulting in a lot of missed strikes and lost bait. One of the best tips I found on the web is to attach a thin copper wire or orange/red thread to the hook eye. After baiting the hook wrap the wire around the shrimp's body. You’ll find that your shrimp stays on the hook a whole lot better. Kids love collecting Ghost Shrimp, so don’t be afraid to let them try it! Just keep a safe eye on them at all times and remember some Ghost Shrimp have large claws and can pinch hard (for their size). I believe current California law specifies that the "capture limit" of Ghost Shrimp is 50, but always be sure to check current DFG regulations for any updated information just to be on the safe side. Ghost Shrimp Pumps are very easy and inexpensive to make and most anyone who can follow these simple directions should be able to build one in a very short time and save themselves some money! Make sure that you examine your test plug. It should be the rubber type, not plastic. Some of them come with a washer on top that is larger than 2". 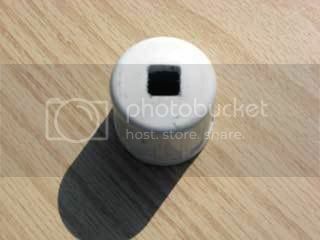 Replace it with one that is 1.5” in diameter and has a 3/8" hole and is of the same thickness. Too small of washer and the squeezing action of the test plug will not work as well. You can also just grind or cut down the original washer to a 1.5” diameter (as I marked) if you prefer. 1. 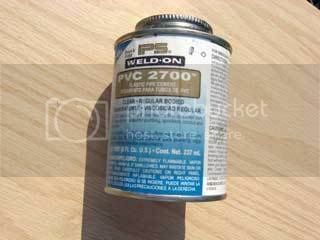 Apply PVC glue to approx. 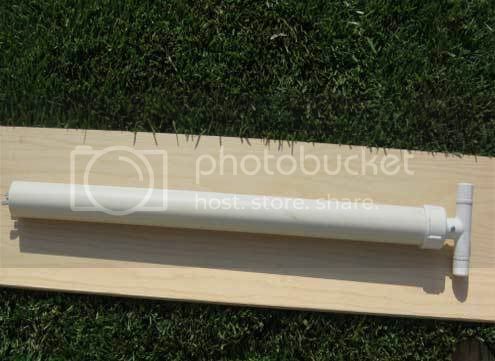 half of one of the 1 1/2" pieces of 3/4" PVC and insert the glued piece half way into one side of the 3/4" tee. 2. 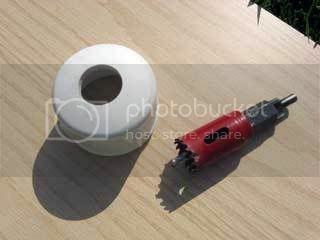 Now apply PVC glue to the other half of the inserted piece and slide one of the 3/4" caps onto that portion. 3. Repeat the same process on the other side of the tee handle. 5. 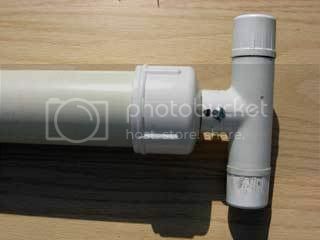 Take the 3" piece of 1/2" PVC and glue it inside the top of the 36" piece of 3/4" PVC. Make sure it is flush with the top of the 3/4" piece when inserted. I added the caps as a way to make the handle a bit wider for a better grip. Rather than just attach the handle with glue, I chose to use a machine screw to make the handle removable so the gun could be easily cleaned. I added the 1/2" PVC reinforcement inside the 3/4" piece as a way to make the top of the neck where the handle attaches sturdier. 1. Take the 2" cap and find and mark the dead center of the cap. 2. Drill a 1 1/6" inch hole in the dead center of the cap. IMPORTANT: Be careful to make and drill this hole dead center. 2. Once the hole is drilled properly, apply PVC cement to the inside of the 2" cap and attach it to your 36" piece of 2" PVC. 3. 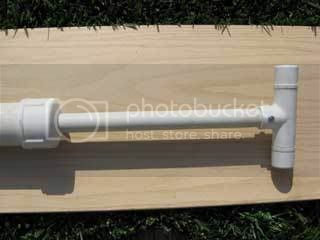 Now slide the 3/4" tee handle onto your 36" piece of 3/4" PVC. Using the hole that you already drilled in the tee handle as a guide, drill a 3/16 hole thru all the pieces . 4. 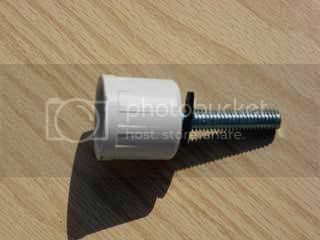 Insert a 2" X 5/32" machine screw & nut and attach the handle. 1. Take the remaining 3/4" cap and drill a 3/8" hole dead center. 2. 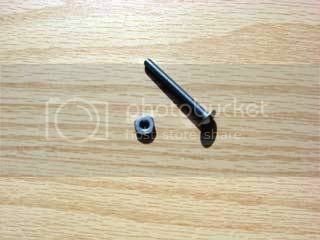 The "test plug" comes with a square shouldered bolt. 4. 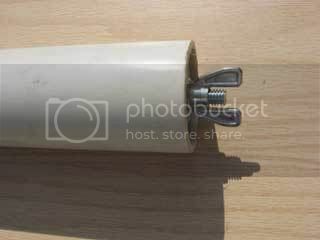 Now glue the 36" piece of PVC (with the attached handle) into the inside of the 3/4" cap. 6. Now attach the rest of the "plug" hardware. 7. 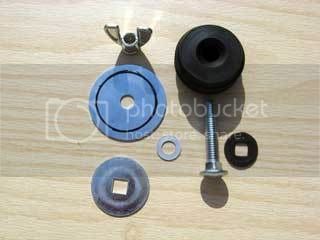 Use the wingnut to adjust the plug so it makes a good seal yet allows the handle and rod to be pumped with good suction. Note: There are certainly better ways and EASIER ways to make a "slurp gun"...... this just happens to be how I made mine. There are all sorts of people on the web selling slurp guns, even selling "plans" on how to build a slurp gun... but if you do a little searching, all the information on how to build one can be found for free on the web..... thats how I learned how to build mine! This article is intended to help you make your own. Feel free to add, delete or change certain features. If you have any questions, or see corrections I should make, please feel free to PM me!